Run 800m, Stretch and band mobility. Royal Marine Commando, Sergeant Barry Weston, 40, of Reading, serving with 42 Commando, Royal Marines was killed on August the 30th 2011, by a roadside bomb while leading a patrol near the village of Sukmanda in the Nahr-e Saraj district of Helmand province, Afghanistan. Barry Weston is survived by his wife Joanne and their three daughters, Jasmine, Poppy and Rose. 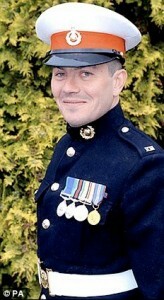 “Baz” was said to have two great passions in life, the Royal Marines and his family. A loving husband and devoted father. He was a man that represented the highest standards and led his men in an exemplary fashion. We at CrossFit Teesside dedicate this workout to him please take 30 minutes from your day to pay tribute to a fallen hero. Rest in Peace Barry Weston.